Birthdays are fun at the Flying Theater Machine. A fantastic new birthday idea; bring the kids to see the show – any Sunday at 11am. -Unfortunately, we are no longer able to host the party in our greenroom afterwards. However, there are several restaurants around that might be able to accommodate a party! You can arrange a personal show just for your party! You and your guests arrive in the theater. You can set the cake on a table on the side of the stage, and decorate the room if you like. Then the cast will perform a 45 minute show. We involve the birthday child and the guests by asking them for suggestions, and at points we even invite them on stage to make the performance extra special. At the end of the show we bring the cake on stage and sing to the birthday child. All the kids get to eat cake and mingle with the actors for about 15 minutes. 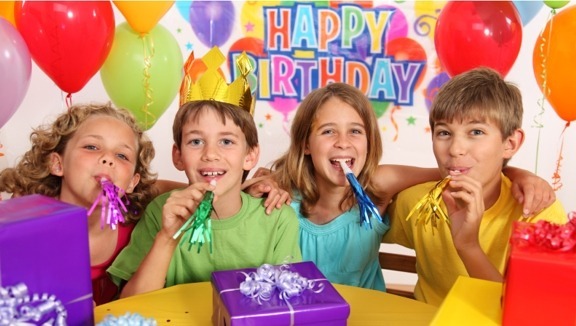 We go out of our way to make your child feels special and happy on their birthday! The total cost for this awesome party is $650 for up to 49 people or $750 for up to 85 people. Due to our tight schedule at the Hideout times are restricted, please email or call for details. We will bring our show out to your home, community center, church, or whatever location we’ll fit in! We will perform for about 45 minutes and then the cast will stay and mingle with the children afterwards. This is perfect if you have a large number of guests and access to a large facility. The total cost for this awesome party is $600 – though mileage charges may apply outside of the Austin area. 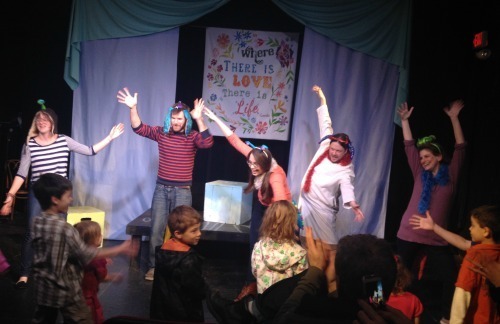 Interested in an Improv Birthday Party? Contact us for more information!